The beauty of balance and interdependency is represented by the Chinese symbol of yin and yang. Now that symbol can be worn as a necklace. All of the opposites in our lives and being are joined in a single force with these beautifully designed necklaces. The basic symbol of yin and yang is the half white with a black dot representing the yang side of light, and the other half black with a white dot representing the yin side of dark. These are all the opposites in our lives that must be there. After all, there can be no shadow without light. Choose a basic style symbol to represent the balance and interdependency in your own life. The balance of yin and yang doesn’t just need to be black and white. Enjoy a little creativity in your balance with one of these stylized representations of the opposites in our world. For me, the roses encased in light and dark colors are a beautiful way to show balance. 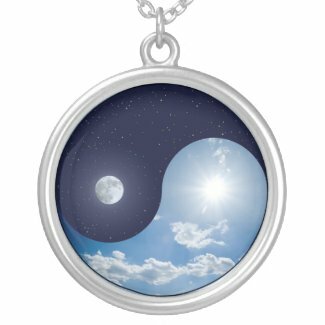 If night and day are part of your balance, this beautiful yin and yang pendant works great. The moon set in the night time sky along side the brilliance of the sun with fluffy clouds shows the balance of all the world. This is one of my favorites and one that shows my own love of both the night time world and the lovely days. Wearing this necklace helps me remember that all the opposites in my world are interdependent on each other. Each of the designs here is available in your choice of 6 different styles. The basic round in large or small, gold finish, silver plated and sterling silver. A beautiful square silver pendant and silver locket are also choices for you. A chain length of 18 inches with a 2 inch extender is part of each necklace. No matter which style you choose, they are all made to be UV resistant and waterproof so you can enjoy wearing them for any occasion and just because you want your balance. 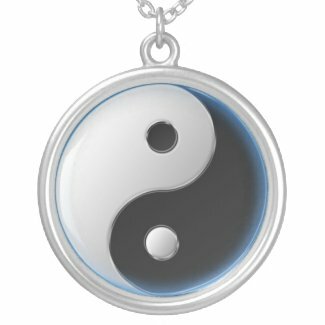 One of these beautiful Yin and Yang necklaces will make a great gift idea as well. See lots more designs at Yin and Yang Necklaces. I do love the yin and yang symbol. I may have to get one for my daughter. She has about all the peace symbols she can wear — time to move on to something new!